January 22, 2016 By Liz 22 Comments Note: This post may contain affiliate links. Healthy desserts can stir up a bit of a debate. 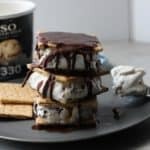 In one camp, there are the advocates for the full-on indulgent treats (“moderation” is the name of the game over here) and in the other camp, you have the health-ifed recipes so you can enjoy a treat when ever you want it. Personally, I kind of like both of these approaches. Sometimes I want the real deal. I want a scoop of full fat chocolate almond chip ice cream. But then sometimes. I’m satisfied with a scoop of Halo Top or a bowl of banana “ice cream”. Truthfully, I think it’s all about what you’re craving. The great thing about these quinoa flour cookies is that I truly think it tastes like a regular cookie. Sure, it’s made with quinoa flour and it’s gluten free, but it has real sugar, eggs (with the yolk!) and chocolate chips, so you’re not skimping on the ingredients. I’d like to think of this as a real cookie with a healthy twist. 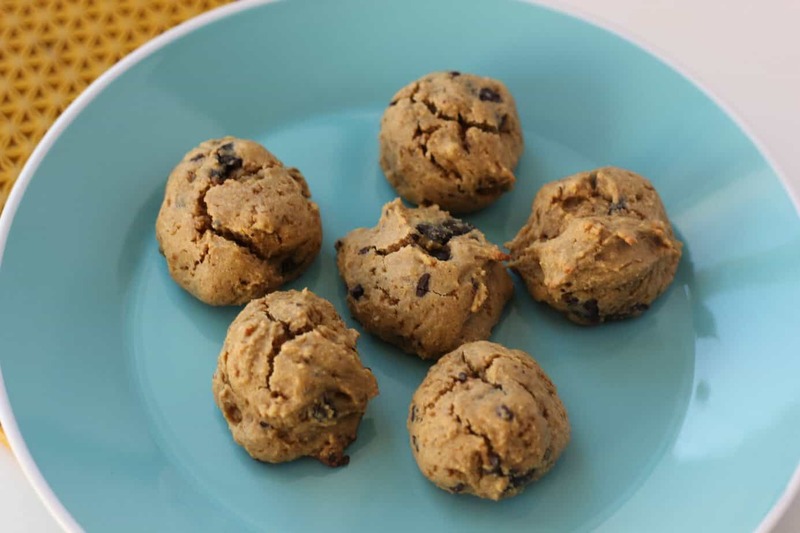 So enough with the debate, let’s get into the recipe for these quinoa flour cookies! 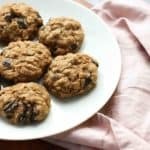 I adapted this recipe from the Tone It Up quinoa breakfast cookie which I’d also recommend, especially if you’re looking for more of a healthy snack and less of a dessert. Combine the quinoa flour, baking powder, salt, and coconut sugar in a bowl. Stir in the eggs and coconut oil until combined. These cookies won’t really spread, so shape them into a ball and then flatten slightly. Bake on parchment paper or a silicone baking mat to prevent them from sticking to the pan. Note: If you’re having trouble finding quinoa flour, check the gluten free section of the grocery store. 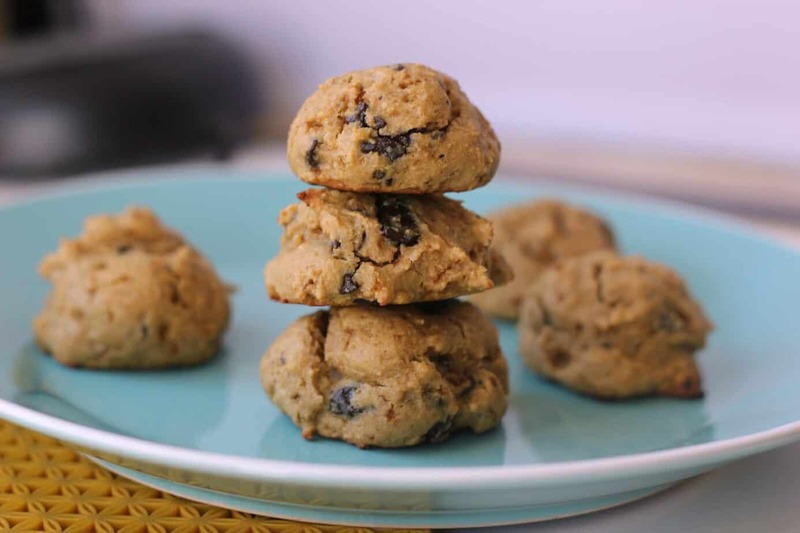 These quinoa flour cookies have a super soft and fluffy texture. It’s almost like a cross between a cookie and a muffin. You could also add in almonds, walnuts, or coconut flakes if you wanted to add a little more texture! You could also make them bigger if you like but I wanted to keep them bite sized. Perfect for a little sweet craving. (Or if you’re like me, you can throw a few of these in your purse when you’re on the go!) If you love a soft baked cookie, you have to try these. What do you think: healthy desserts, moderation, or a little of both? I definitely prefer a little of both. Frozen grapes are my go-to “healthy dessert”, but every now and then, I pop a s’more into the microwave. I think the best way to insure you’re going to binge on something is when you say you’re “NEVER” going to eat it again! Happy Friday! Stay warm! Cute little guys! Interesting ingredients there! To your question – I think you have to enjoy life and absolutely dig in to your favorite sin once in a while. Just don’t make it a regular thing. I personally would rather have a few bites of something really good than a whole thing of just a so-so dessert. Totally with you–I prefer full on indulgence AND healthified sweets. These look great! You always make the best and most unique recipes. These look really good! I must say I have had a problem to cooking with quinoa, I don’t particular care for the grain, because I think it doesn’t taste like anything. 🙂 I know that as a vegan this is a great way to introduce protein to your diet and I have been really struggling with perfect marriage between taste and quinoa. 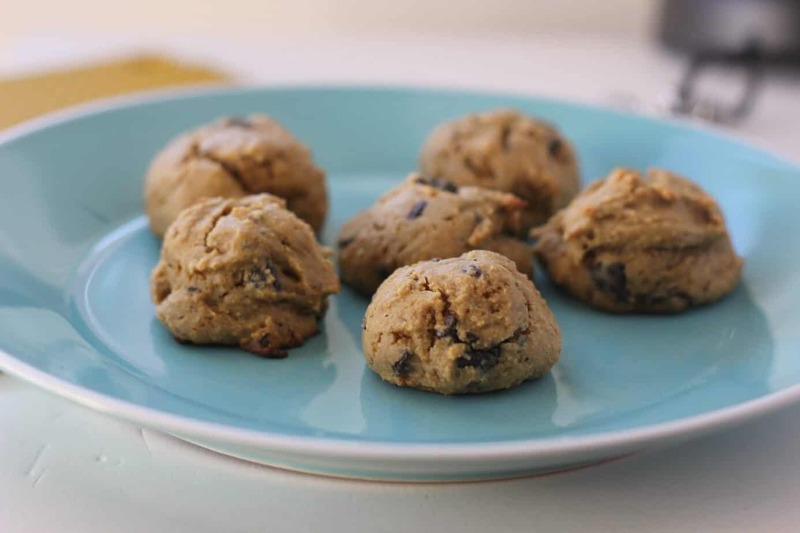 But I definitely love the idea of having an alternative flour option to the typical cookie. Thank you for sharing! 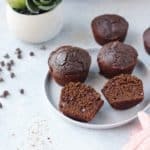 These look delicious and I am so happy to see a just quinoa/other grain free flour recipe, makes grain free so much easier! We do a mix. Sometimes we have fruit and sometimes we have brownies. 🙂 I always like finding ways to lighten up recipes though, so we get good flavor and less bad stuff! Yum, these look delicious! Moderation is the key over here too! I have coconut and almond flour right now, I wonder if that would work? I definitely like having healthier desserts around. I enjoy having a snack at night and it’s often something I’ve made, so it’s usually not triple chocolate cake every night. I definitely have my fair share of the real deal, but I enjoy the healthier versions too! Putting quinoa flour on this week’s grocery list! These look/sound delish! And I’m totally in the healthy dessert camp when it comes to homemade stuff. Indulgent desserts are for eating out (in my mind)! i have not baked with quinoa flour so this is something i’d be up for trying!!! I don’t have a big sweet tooth, so if I have dessert I’ll usually have a little of the real thing. I’m all for healthifying desserts, though, just as long as I can’t taste the difference! I agree – a little of both!! Most definitely the way to go. These cookies look just divine. I’m a huge fan of quinoa in its cooked form, but have never used quinoa flour so am eager to try it out! Pinned! I have made these a couple of times and decided to try a few changes this time. I’m not vegan, so I swapped coconut oil for butter – yum! Then I did 3/4 cup of quinoa flour and 1/4 cup of almond flour. Then added a dash of vanilla. YUM! The recipe was good as is, but a little dry and the quinoa flavor was a little too strong for me. This worked great! That’s a great idea! Love that tweak! Could apple sauce be an egg substitute in this receipe?